8x10 glass negative photographed by James Burton August 25, 1903. 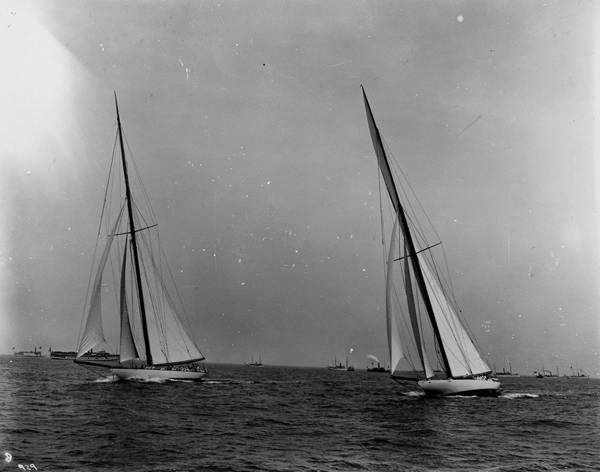 Image of RELIANCE, #G16, and SHAMROCK III racing, port bow view, just after the start of the second race of the America's Cup on New York Bay, New York. Handwritten neg. sleeve info. : "B-929 / 3rd Race[sic] / Sept 3[sic]" Handwritten on emulsion side of neg at top margin. : "Just after start / Cup Race 3rd[sic] / Aug 25th" and at the bottom right corner: "929" and "8". Adhered to surface upper left a piece of paper: "4-". CREDIT LINE: Mystic Seaport, Rosenfeld Collection, James Burton photographer.